Founder of the monasteries at Ebchester and St Abb's Head. Æbbe was a princess, the daughter of King Æthelfrith, first king of Northumbria and friend of Aidan of Lindisfarne. After King Æthelfrith had been defeated and killed by invaders, Æbbe, her mother and brothers fled north in exile. It was during this time that she and her brothers were converted to Christianity. 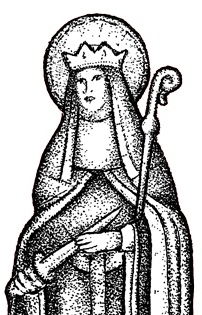 After their eventual return, and with her brothers on the throne of Northumbria, Æbbe returned from exile and established a monastery at Ebchester and later at St Abb's Head. This religious house was a double separate monastery of both monks and nuns governed by Æbbe. Legend says she became a nun to avoid the attentions of Prince Aidan. She eventually died in 683. After her death the community fell into disorder and through carelessness the monastery caught light and was burnt to the ground. The monastic site was abandoned. Coldingham Priory was re-established in 1098 by King Edgar of Scotland further inland than the orginal monastery. Æbbe was a great teacher and politician, bringing Christianity to the then pagan Angles who had been settling along the east coast of Britain.